Like most humans, Neil Hughes gets anxious. But he’s no longer hiding and pretending that everything is okay. Click here to sample the first few chapters for FREE! Hello. I’m Neil’s Inner Critic, the voice in his brain that reminds him how useless he is. I warned him that a ‘comedy’ book for the anxious would be a guaranteed disaster. Especially if it was an idiot like him writing it. But he ignored me, so this is my final bid to save humanity from reading his nonsense. It’s full of embarrassing stories I can’t allow you to hear. And ‘helpful’ waffle about trading anxiety for contentment. Neil claims it’s “a warm, humorous and useful manual”, and that he wishes he could have read it when he was struggling with his own anxiety. Please believe me. Stay away from this book. Save your inner critic… while you still can. 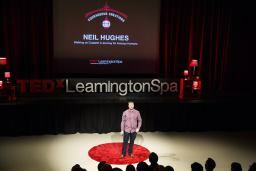 Occasional comedian and full-time worrier Neil Hughes isn’t the kind of person you’d expect to write a helpful book. Or, at least, so his Inner Critic is constantly telling him. No wonder he’s suffering from anxiety! But during his nervous bumbling through life he somehow learned how to reduce his anxiety and quit his unhelpful mental habits. Oh… and he stumbled on the Meaning of Life, too. Now he’s sharing a combination of hilarious real-life stories, inventive fantasy fiction and badly-drawn graphs to help you to be less anxious and more happy. In this compelling, surprising and delightful guide to life for humans, Neil explores how to (gently) uproot anxiety, all while battling the irritating interruptions from his doubtful Inner Critic. Then – after sorting out love, crises, relationships, purpose, and contentment – he even considers how we can deal with death and the Meaning of Life itself. I’m interested already! Where can I get it?! Great book, would recommend to anyone… which brings me onto my only criticism: The title. This book is definitely not only for anxious humans. I wouldn’t consider myself a sufferer of anxiety, and have enjoyed it immensely and found it really helpful. 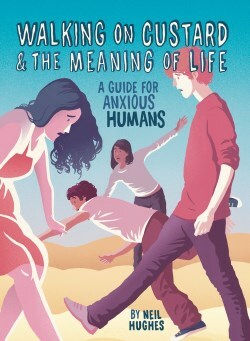 It achieves what many self-help books lack: warmth, humour, and relatability, but without compromising on wisdom, insight, and practical, useful advice. I really, really enjoyed it. I recognised myself a lot and beyond finding it a charming and funny read, I also found it a helpful one. It is a brave book and a noble one because, really, what better thing can a person do with their own suffering than to use it to try and help others. It’s on my read-this-again shelf. Smiling icon made by Freepik from www.flaticon.com is licensed under CC BY 3.0 (colour inverted version is by me).